Kathy Reiffenstein offers a three-part series (part 1, part 2, part 3) on fundamental speechwriting techniques such as alliteration, antithesis, and rhetorical questions. Words are the primary mechanism we use to transmit ideas. Words encourage, challenge, persuade, teach and transform. Yet many business presenters speak without adequate knowledge of, or attention to, the tools that can hone their craft. It’s the audience that matters. Remember this is a day of celebration. Don’t make the speech a downer. If you see the humor in life, share that humor in your speech. Share the perspective that is uniquely yours. Joey Asher provides a valedictory speech template. Good valedictory speeches reflect on high school years, tell stories, and mention lots of names. Bronwyn Ritchie warns against the use of waxy, or superfluous, words. 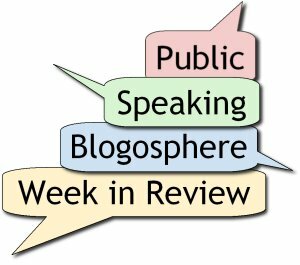 Tim Gordon has compiled an 11-part series (and growing) of articles for making public speaking fun. This series covers a wide array of techniques, including props, Q&A, humor, magic, role play, audience participation, door prizes, and much more. Olivia Mitchell suggests how to prevent and recover from mind blanks. Andrew Lightheart examines how speaking slower benefits you and your listeners. John Kinde analyzes how to be successful when topping a joke. In this case the Joke, Topper, Topper sequence worked perfectly. Each subsequent addition to the humor progression received a stronger response than the previous. Ideally, that’s the way it’s supposed to work. Jan Schultink shows how to improve a poorly-designed chart slide through a series of small design changes to colors, shapes, and usage of space. The idea is to make the data as calm as possible. Also note that through consistent use of corporate colors there is no need for additional “house style” graphical elements on the pace. Mike Pulsifer demonstrates several visual options to the boring agenda slide. Make your point and then click on the slide to underline or reinforce what you’ve just said. Let the slide speak for itself. Let the animation on the slide can do all the talking. Use visual signposting (letting your audience know where you are in your presentation, where you’re going and where you’ve been). “May I have a copy of your PowerPoint presentation?” asks an audience member. “Is there something I said that isn’t clear? Do we need to go back?” I ask. Lisa Braithwaite urges speakers to overcome chronic lack of preparation. You need to make a change. You need to commit to thorough preparation. You need to give yourself enough time to think it all through, construct it well, practice it completely and really be ready when it’s time to present. If you want to get to the next level and you’re always throwing together your presentations at the last minute, forget it. It’s not going to happen. Ian Griffin argues that public speakers must pay attention to logistics. I rely on a standard three-page logistics form. This includes data on location, date and time of the talk. It includes the speech length, other speakers on the Agenda, audience size and expectations. I also list press and PR contacts and both the event coordinator and A/V contact details. Having a standard template minimizes the chances that something will slip through the cracks. Dr. Daniel K. Hall-Flavin offers a clinical perspective on how to overcome public speaking fear. Use audio and visual aids — for yourself, and for the audience. Practice in front of people you know. Focus on your material, not your audience. Don’t be afraid of a moment of silence. Jim Anderson examines the goals for an effective speech introduction. Content: What are you going to be talking about? This is designed to grab your audience’s attention so that they will be eager to hear more. Context: Just knowing WHAT you will be talking about is not enough, your audience needs to know WHY you will be talking about it and why they should care. Providing them with this information will start to build a bridge between you on stage and the audience even before you start to speak. Credibility: Providing the audience with a reason why you are the best person to be talking to them about this topic is the final part of an introduction. All too often we put too much information here (we are, after all, proud of ourselves). In all honesty, one or two sentences does the trick. Denise Graveline lists 5 tips for introducing a speaker. Don’t put it together at the last minute. Do ask the speaker for input. Do add some perspective of your own. Susan Trivers suggests several ways to embed your brand into your audience’s minds during a presentation. Promotional products are an easy and inexpensive way to keep your company top of mind. A mug, a pen or a magnet is in view daily and you hope they cause your clients or prospects to call you. Jane Atkinson encourages you to analyze your knowledge about aspects of the speaking business. It’s been a while since I’ve been publishing on Six Minutes, but articles should appear regularly once again. I’ve been busy teaching courses, reading some excellent public speaking books, and successfully running the Vancouver International Marathon (my first! )… all of which should provide wonderful Six Minute articles in the future. Thanks to everyone who contacted me to see if everything was alright. Great list this week (or technically, last week), Andrew. Bunch of good articles to follow up on! http://tinyurl.com/q3drvs Best public speaking tips and techniques! It’s all over the place, so pick and choose.